The picture below shows a Ignition Coil. Thousands of other top quality spares listed on our website at refreshingly low prices. NARAKU racing ignition coil with high secondary coil windings. 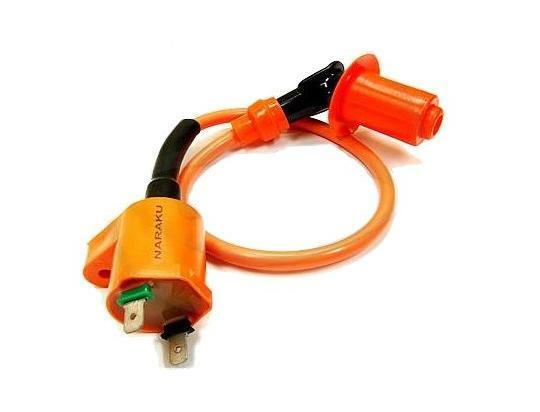 The standard voltage of original ignition coils is approx 16,000 volts. The Naraku offers almost double this voltage at 31,000 volts. better running at colder temperatures and a clean ignition at higher revolutions. The coil has a molded HT cap design to prevent moister interference. Increase performance, efficiency, fuel consumption & reliability.